Applications of terrestrial laser systems for fuel mapping and characterization. Using pre-during-and post-fire measurments to improve the performance of fire severity indices that are derived from satellite imagery. Work with prescribed fire managers to use imagery as a basis for considering the causes and consequences of fire severity. Monitoring, mapping, and quantitative resource assesment. Collaborate with USDA Forest Service Rocky Mountain Research Station scientists on large-scale laboratory investigations of flame geometry and behavior. Collaborate with USDA Forest Service Rocky Mountain Research Station scientists on field-based remote measurements needed for firefighter safety zone research. The Remote Monitoring project is a foundation of our fire season activities. Over the years we have worked with eleven national forests, three national parks, and various state and international organizations to develop and deploy remote camera capabilities in isolated areas. 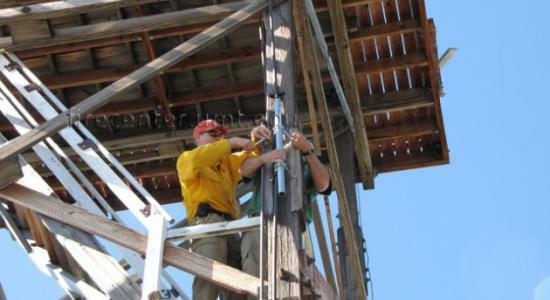 In 2012 we expanded long-term deployments on the Clearwater-Nez Perce, Flathead, and Bridger-Teton National Forests; initiated a new long-term project on the Lolo National Forest; and assisted regional information technology staff to plan and procure equipment for the expansion of existing systems. Our remote monitoring work directly impacts managers by helping them to increase situational awareness, decrease exposure, and save money during wildland fire events.